The Autonomous Systems Lab (ASL) was founded by Professor Gabriel Elkaim when he joined the University of California at Santa Cruz in 2003. 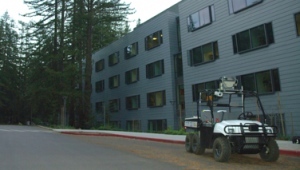 It is one of several labs that work on control theory at UCSC. The ASL specializes in guidance, navigation, and control, path-planning, computer vision, and sensor fusion within the scope of autonomous systems. We aim to reduce the cost of autonomous systems through open-source development of both complete autonomous systems as well as their required onboard sensors. As such, all of the projects developed in-house have publicly available code repositories and bug trackers online with links from each project's site. One of the robotic platforms developed by the ASL is the Autoboat, a 15' electric watercraft designed for low-speed long-duration sensing missions. It is solar-powered by 1kW of onboard solar panels. It is currently being explored as a sensor testbed for long-term oceanography as well as for investigating navigation algorithms at sea. Complementing our watercraft is our land vehicle, the Overbot. It competed in the DARPA Grand Challenge in 2005 and was donated to use afterwards. It has since become the primary platform for testing sensors and control algorithms for the lab as it was designed for autonomous navigation in challenging, off-road environments and already contrains a complete sensor suite of LiDAR, dGPS, radar, and cameras. It is in the process of being refit to improve reliability. The final platform undergoing continual work is the SLUGS autopilot. This is a general-use autopilot that integrates with electric-motor foam-body aircraft to provide autonomous navigation. It integrates with a groundstation running on a laptop for in-flight reprogramming and mission control. As it is an open-source project many other universities are investigating it for use in their own projects and research. Finally, we aim to facilitate science and technology education within primary and secondary education programs by participating in SURF-IT and other community programs.